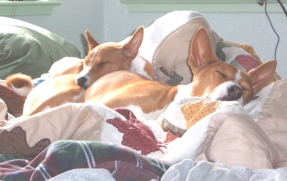 Rio is our first homebred basenji. She was the fourth born in a litter of four and has voiced her opinion from the moment she was born. Rio has always acted as if she owns the place. She adores her Uncle Nicky and plays with him every chance she gets. She loves being part of the family. Rio has started her show career. 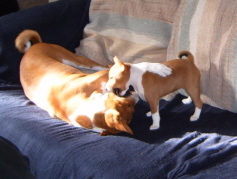 She placed 4th place in a very large puppy group at the Basenji Club of Northern California's puppy match in June. 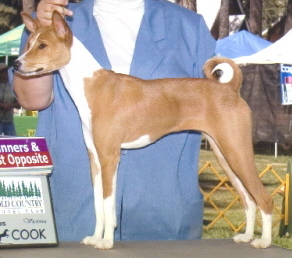 On September 3, 2005, Rio earned her first point towards her AKC Championship under judge Dale Simmons. She still has a lot of maturing to do but we are having fun in the ring. Rio has started her lure coursing career. She earned her JC title on June 4, 2006 and got her first point in AKC coursing on June 18, 2006. Rio has also started her ASFA career, earning her first points at her first ASFA trial on August 12, 2006. We are very proud of our new young courser. 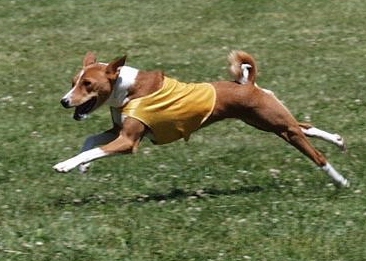 Rio is also training for agility, watch her work with me on a practice course.